​A power inverter’s job is to take 12V DC power and turn it in to 110V AC, for powering electrical systems, devices … everything from a smartphone through to a breast pump (and that’s a surprisingly common theme for inverters). ​But, without getting too technical, there is a difference between a pure sine wave inverter, and a modified sine wave inverter. Generally speaking, the modified sine wave inverter is much cheaper – you can pick a small one up for less than $20, ​and these are only really recommended for simpler electrical systems, anything with complex or delicate electrical components should use a pure sine wave inverter. If you’re not sure what you’ll need, take some advice before purchasing. ​To an extent, what you use it for could be dictated by the actual inverter​. Some only offer small levels of power, and can only be run through a cigarette lighter socket in your car, while others can be hard wired – a general rule is that if you want to run anything over 150W, you should either hard wire the inverter, or get a thicker power cable – a cigarette lighter socket is only rated for that power at the max. ​Let’s assume you have the ability to power it however you need, then an inverter has many different uses – take it camping, on road trips, to power outdoors events & parties, an extra power supply for your RV or even as emergency back up power at home – providing you get a big enough inverter. ​It’s worth remembering that items that use a lot of power aren’t really going to work with an inverter, the sort of stuff that you may find in your home, but generally speaking, it’ll do most things that are necessary, providing you’ve made the right choice for your need. ​It’s worth considering what you actually want to use the inverter for before buying one – just need the occasional charge for your laptop while on the road? Or need it to power some serious equipment in RV? ​Of course, they’re rated by the power they can produce, but will one outlet be enough? Two? Three? And what about an extra facility for USB charging, all while sending 110V AC to the outlets? 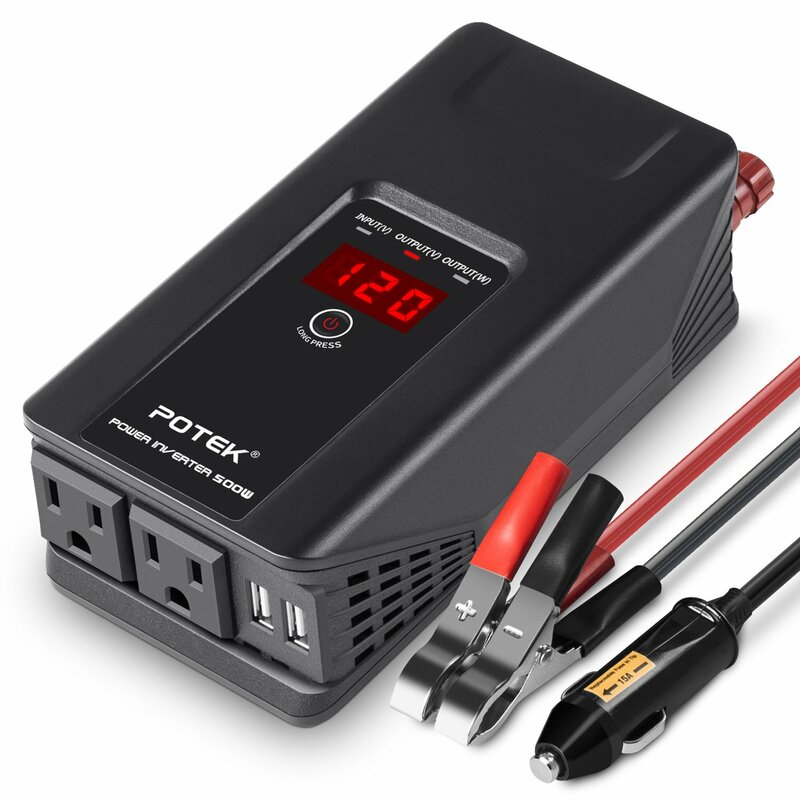 One further thing to consider is that some car-based inverters will only run when the engine is running – they may draw some power even when they’re officially turned off – see more on that in the review of the POTEK. 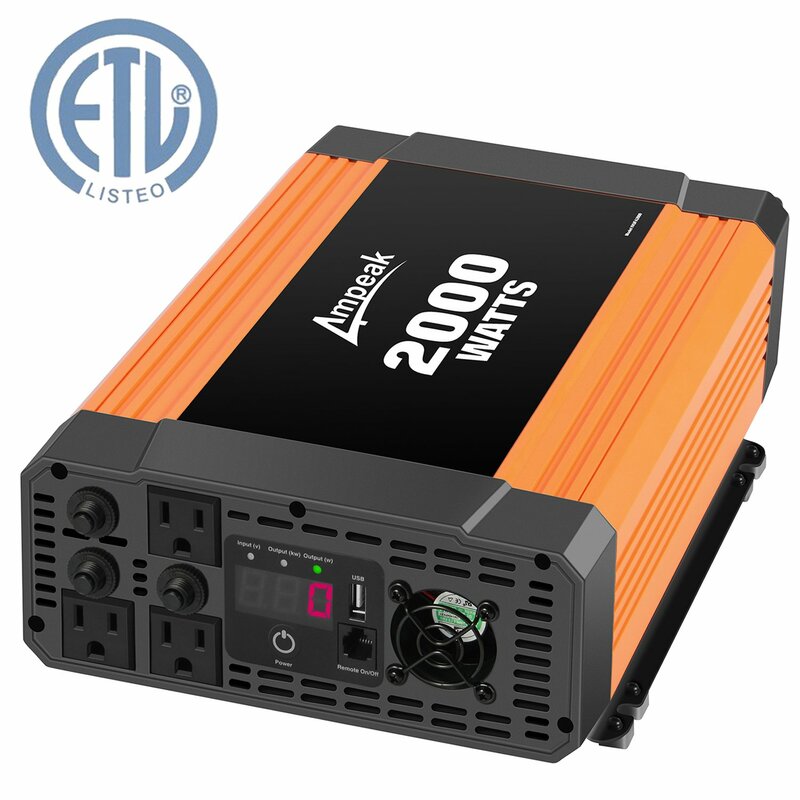 The BESTEK represents excellent value for money, and it’s just about powerful enough for most jobs, with a continuous rating of 300W, and a peak load of 700W. It has 2 regular 110V AC outlets and 2 USB ports rated at 2.4A each. ​The built-in 24” power cord (cigarette lighter socket) means that it can’t be hard wired, but this is aimed more at keeping it handy in the car, rather than a domestic use. It ​does more than enough power to charge a laptop or cell phone, and the built-in 40A fuse should protect most things from being damaged. ​With that in mind, the BESTEK also incorporates a number of safety features – warnings for overheating, under or over voltage and short circuits. It’s all built in a durable metal housing, and there’s an 18 month warranty on it. ​One word of note though – thanks to the cooling fan continuously running, the car needs to be kept running to power it. Once switched off, the outlets have no power, but the USB port continues to be live. ​This seems to be the most professional inverter here, with a high power rating and only the ability to be hard wired (you will need to purchase the cables separately). 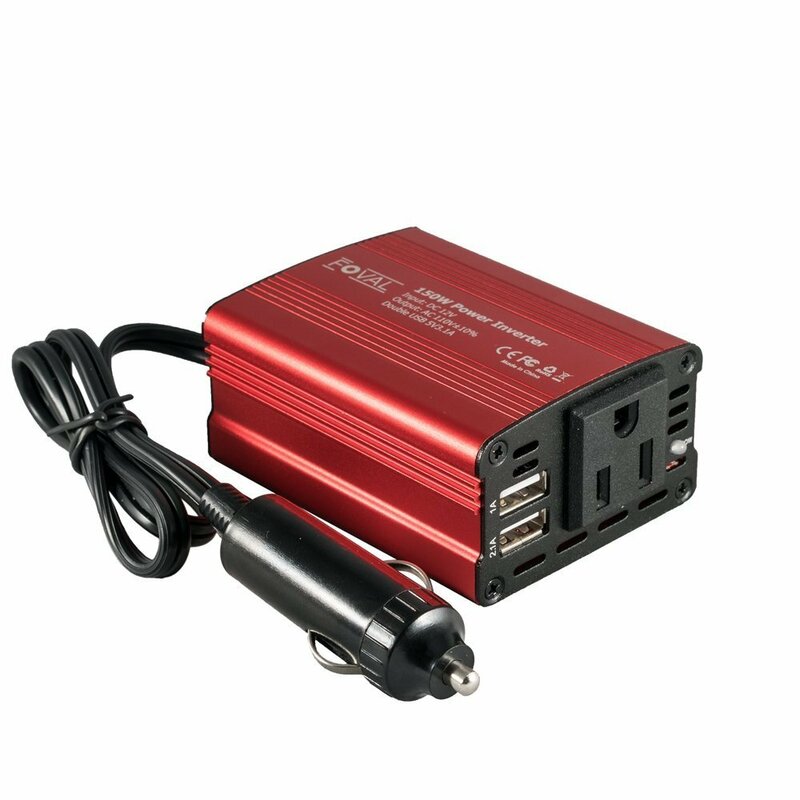 It has three outlets and 1 USB port, that can provide a continuous supply at 2000W or a maximum peak of 4000W. ​It has all the usual safety features, with an audible alarm, just in case you can’t see the display. It will detect over and under voltage problems, over loading, short circuiting, and over heating. It’s built tough and comes with an 18 month warranty. If you need something as a power reserve in your RV, or as a back up in your home, then the AMPEAK should be the one you pick. ​Although I like the fact that it needs hard wiring (for maximum power), that’s also its downfall – you can’t just throw this in your trunk for emergency use in the car. ​For the money, the POTEK inverter is a great buy – it has enough power (500W constant, 1000W peak), two outlets and 2 USB ports. The built-in cooling fan is intelligent – only cutting in when the load exceeds 200W, which means virtually silent running, and the whole thing weighs just over one pound. ​Now, I mentioned in the introduction about power drawing off when the device is off​. It’s called parasitic drain, and to an extent, all electrical appliances do this, but the POTEK seems to draw quite a lot – with the inverter off and nothing plugged in, it draws around 0.1A, but turn the inverter on (and still without anything plugged in), that draw goes up to nearly 0.6A​. You definitely need to keep an eye on the power levels if you’re intending on leaving it. ​Aside from that minor niggle, everything else is great – ​the product has a digital readout (illuminated) and that can tell you input voltage, output power in both volts and watts or display low voltage, high voltage, short circuit, over load or over heating warnings. ​This would be my choice for an every day inverter that you can just leave in your glove box. ​Cheap and cheery – 1 outlet, 2 USB ports (3.1A total) and small, with a weight of just 8oz, this is almost pocket sized. It does everything you need to, providing that comes within the 150W power rating (300W max load), ​even at less than twenty bucks, it has a couple of neat touches. ​The cooling fan is almost completely silent, it’s simplicity itself to use – no readouts with a vague message, just colored LEDs to tell you there’s a fault. 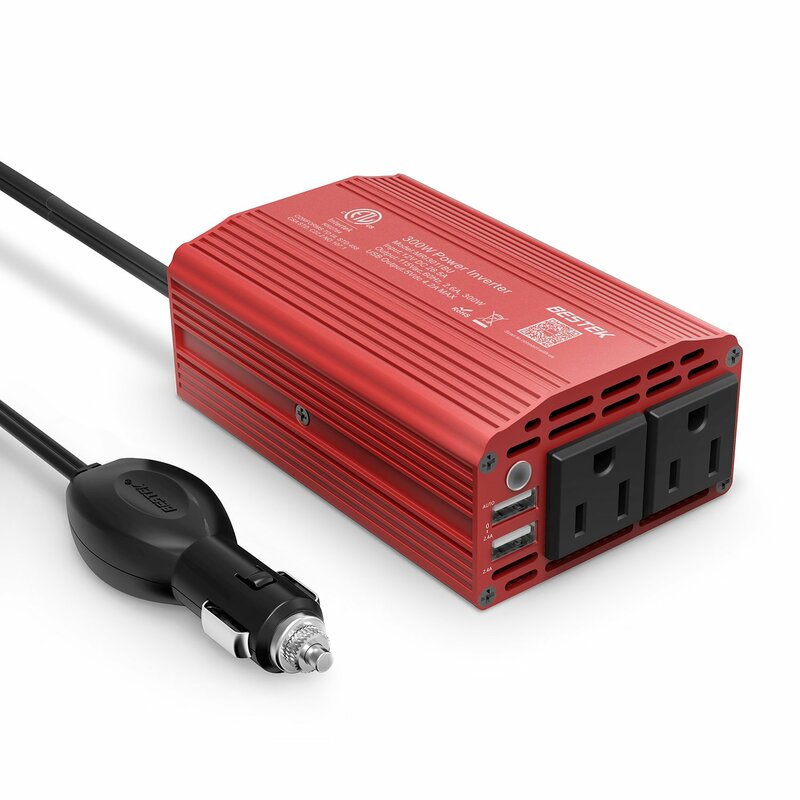 A 16” power lead is just about long enough to make the inverter moveable (so it’s not stuck on the center console), and it all comes with an 18 month warranty. ​Like I said, it’s cheap, but it works. ​Any of these inverters will do the job, providing you’ve understood just what that job is – don’t buy the Foval if you’re looking to fit a secondary power system for camping, or to run form a deep cycle battery, equally, there’s no need to spend $150+ to charge your laptop or cell phone on the odd occasion that you find yourself stuck. ​Throughout writing this review, it seems that there’s a common theme about some electrical items not running correctly when powered by an inverter. As I mentioned earlier, in my experience many of these problems are caused by the difference between the modified or pure sine wave inverter. ​Final word of advice – even though we’re only talking about a 12V DC power supply, any connections that you make should be of sufficient quality to avoid the risk of damage or short circuiting, especially if fitted to a vehicle.